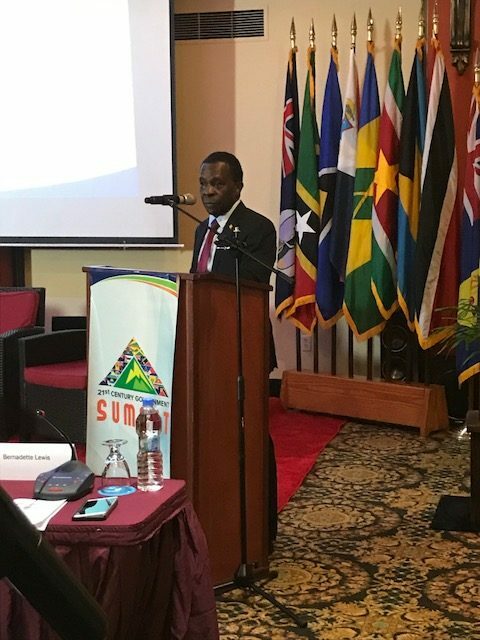 On Tuesday, 16 January, Dr the Right Hon Keith Mitchell delivered the keynote address at the Prime Minister’s Summit in Antigua and Barbuda. The summit is an initiative of the Caribbean Telecommunications Union (CTU) and Caribbean Centre for Development Administration (CARICAD). Under the theme ‘Towards 21st Century Government,’ Dr Mitchell, who is also the lead Prime Minister with responsibility for Science, Technology and Innovation under the Caribbean Community (CARICOM), presented extensively on the Road Map for Information Communication Technology in the region, highlighting areas such as the region’s Road Map for a single ICT space. This vision for a single ICT space was approved by the Heads of Governments in Guyana about a year ago. In that way, government will become more ‘citizen-centric’ or citizen-friendly, with open, interactive and efficient processes in delivering services to citizens. The summit also saw the participation of the host country’s Prime Minister, Hon Gaston Browne, as well as ministers and other government officials from across the Caribbean, leaders in the telecommunications industry, diplomats and other officials. Grenada’s representatives also include Dr Spencer Thomas, Chairman of the National Telecommunications Regulatory Commission. Prime Minister Mitchell returns to Grenada this afternoon. In his absence, Hon Gregory Bowen is the Acting Prime Minister.